Spring brings more than great weather – across the U.K. and the U.S., this is the season of pets! 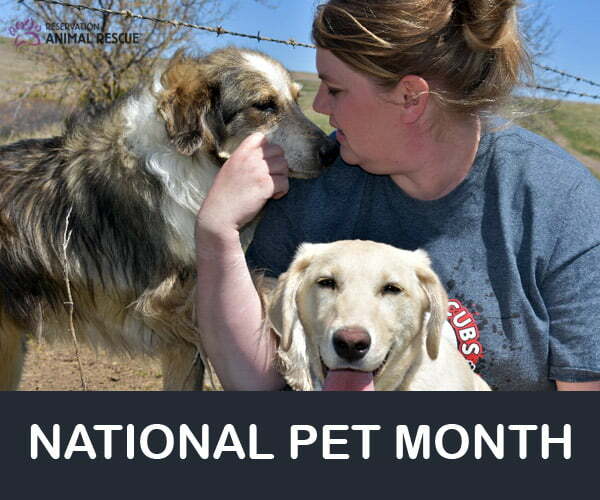 National Pet Month is celebrated in April in the U.K. and until the end of May in the U.S., and is a chance to renew our efforts to properly care for our four-legged friends. Reservation Animal Rescue (RAR) is Partnership with Native Americans’ (PWNA) animal services program, which works with reservation partners around the country to improve the lives of injured and orphaned animals and to educate reservation communities on proper care of pets. RAR services support spay and neuter clinics; rescue, rehabilitation and placement of animals through foster care; community education; and ultimately finding forever homes for stray animals. In many tribal communities, stray animals are a common sight, which makes population management a necessary undertaking. But as it turns out, there are health benefits to these efforts as well. A 2013 Banfield report on pet health found that animals who get spayed or neutered have longer lifespans than those who do not. In 2017, generous RAR donors made it possible to help reservation partners feed and care for stray animals, ensuring healthier animals and communities. The Oglala Pet Project (OPP) is one of the partners that received a RAR spay/neuter grant, and the impact is being felt across the Pine Ridge Reservation. As they shared, “We successfully spayed or neutered 61 animals from our start of this grant. This included 33 dog spays, 13 dog neuters, 8 cat spays and 7 cat neuters.” This work, they explained, prevented more than 1 million kittens and over 700,000 puppies from being born without a home. Native communities have been proactively tackling the homeless pet population for years and now are able to help more animals through support from RAR and its donors. This year, celebrate National Pet Month by getting your own pet spayed or neutered, ensuring they enjoy a long, tail-wagging life! This entry was posted in Humanitarian, Programs and tagged cats, dogs, National Pet Month, neuter, Oglala Pet Project, pets, RAR, reservation animal rescue, spay. Bookmark the permalink. Trackbacks are closed, but you can post a comment.